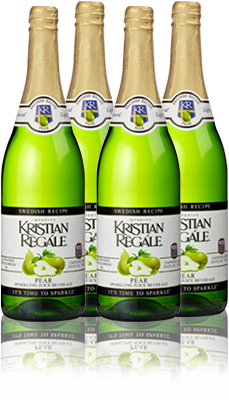 Made from a traditional “Swedish Pear Cider” recipe, but without the alcohol, Kristian Regále Pear Sparkler is our most popular flavor. It brings together delicious real pear juice with apple juice to create a delicate, sophisticated taste. Purified sparkling water, pear and apple concentrates, beet sugar, natural flavors, citric acid. How did a sparkling beverage with a Swedish recipe end up here? We use 100% natural ingredients to find unique, clean, crisp flavors. Our passion is far from typical... and so are our products. © Copyright 2012 Kristian Regále. All Rights Reserved. Powered by WordPress.